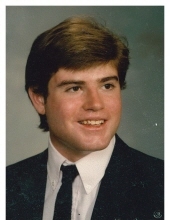 Stephen Michael Swank, 48, of Elverson formerly of Coatesville died Thursday, September 20, 2018 at his home. Born in Phoenixville, he was the son of Sally Hartman (Swank) Beam and her husband Cal and Paul Swank and his wife Penny. In 1988, Steve graduated with honors from Coatesville Area Senior High School, where he was drum major, a member of the National Honor Society, the wrestling team, wrote for the school newspaper, and the yearbook committee. He graduated from Bucknell University and received his Masters Degree from University of Kansas. He was a member of the Chester County Choral Society. Steve was employed in the IT Department of Parsons Brinckerhoff, Ephrata. Stephen was an avid fan of Liverpool Football Club and participated in many Tough Mudder Obstacle Races. In addition to his parents, Steve is survived by his two sons: Nathaniel and Adam, and their mother Jovielyn Swank; and his sister, Kathryn Henson, her husband Eric and their son, JP of Cherry Hill, NJ. Steve’s funeral services will be held Thursday, September 27, 2018 at 11am at Hopewell Christian Fellowship 2286 Hopewell Road, Elverson with visitation beginning at 10am. Visitation will also be held Wednesday, September 26, 2018 from 6-8pm at Wentz Funeral Home 342 E. Chestnut Street, Coatesville 610-384-0318. A Memorial Service will be held Friday, September 28, 2018 at 7pm at Doe Run Presbyterian Church 3104 Doe Run Church Rd, Coatesville. Interment will be held in Hopewell Christian Fellowship Cemetery, Elverson. Memorials in Steve’s honor may be made to the 529 Educational Fund for Nathanial and Adam Swank c/o Waddell and Reed 144 Hopwood Road, Collegeville, PA 19426. To send flowers or a remembrance gift to the family of Stephen Michael Swank, please visit our Tribute Store. "Email Address" would like to share the life celebration of Stephen Michael Swank. Click on the "link" to go to share a favorite memory or leave a condolence message for the family.